Huntington Beach homes are often easily invaded by Termites, Rats and Pests. The cool ocean breezes that benefit residents during the summer months are also desirable to these Termites and Pests. The closer your home is to the ocean the more likely it is to suffer from Drywood Termites and Dryrot Fungus. Drywood and Subterranean Termites are seasonal pests that are triggered by weather changes. The coastal temperature changes are often more dramatic than inland cities causing more pest activity. In the raining season of February March and April Subterranean Termites are triggered by the cool foggy mornings then sudden heat of the day after the clouds burn off from the California sun. Drywood Termites in the summer often swarm an extra time or two thinking that Fall has set in from the cool ocean air creating a temperature change of sometimes over 10 Degrees during the day. Those miserable days of heat the inland cities suffer through are repaid through increased termite activity. 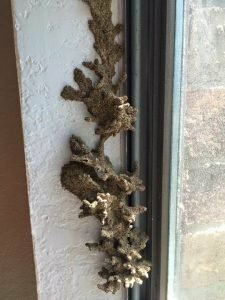 The Termites feel the heat like we do and when those coastal breezes in the afternoon cool us down they also trick the termites into thinking that the season is changing causing swarms. Residents of Huntington Beach Love their Pets. Unfortunately for Huntington Beach Residents Pets often attract pests like Fleas which can really irritate the pets and their owners. Fleas like all pests are seasonal and occur during the spring/ summer months. Without a barrier to protect the our pets we are likely going to suffer through the infestation with our cat/dog until a professional eliminates the issues. Roaches are yet another pest that Huntington Beach residents suffer through due to perfect temperatures and a fondness for animals. In most homes pet food is left out for the pets to eat as they get hungry. This poses a constant food source under ideal breeding conditions for pests. Our unique system covers your home from all termites and general pest control by creating a barrier that is Naturally Derived your children and pets comfort and protection. 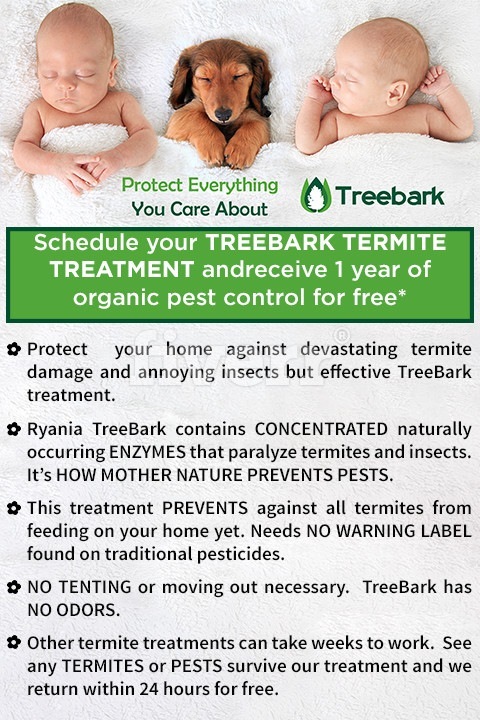 The Ryania based Treebark Product (Chlorantrhoprole) is able to effectively control and prevent these pests and termites from returning. This treatment and barrier is applied free of charge during the warranty period and if by chance you see any signs we will return absolutely no charge to reapply the barrier to prevent any further signs. Are you having a problem with termites? Is your nice new home being eaten up by destructive little bugs? Are you ready to drop the hammer on these pesky creatures and keep them from destroying your house? Well, look no further than Treebark Termite and Pest Control! Since the beginning of human history, we have been building things out of wood, especially our homes. And, since the beginning of history, we have had to deal with the recurring plague that is the termite. They creep in like thieves in the night and eat your home piece by piece, working hard to destroy what you worked hard to attain. That’s where we come in. We are the ultimate destroyers of termites! We have so many ways to find these rotten little insects that I almost feel sorry for them! Just kidding! I don’t feel sorry for termites at all…I want to eliminate them! And I want you to hire us to eliminate them from your life forever. There’s just nothing worse than moving into your new home that you probably saved for years to be able to afford, planning to put down roots and make this your home for years…only to find out that the house came with hundreds or even thousands of tiny roommates. Call us today at (714) 406-4919 for a free estimate and you can begin the process of evicting all these little trespassers! 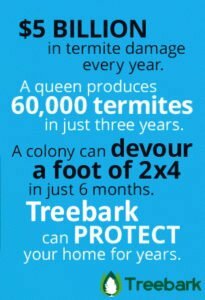 At Treebark Termite And Pest Control, we know what a stressful experience it can be when you realize that your home is literally being eaten from the ground up. You may have already tried some poisons or repellents, and you probably haven’t gotten the results you wanted. We have been destroying termites by the thousands for a long time now, so we completely understand this. But before you go pulling your hair out or calling up the funny farm to admit yourself, give us a call first and you will see just how easy this problem can be solved. Our trained professionals and advanced techniques will make it a snap. And that’s where we come to the best part about our company…Treebark isn’t just any bunch of exterminators. Oh, no! We are dedicated soldiers in the eternal war against bugs! Rather than simply relying on the conventional methods, we have utilized the latest research to help us perfect our extermination techniques. But you might be thinking, “there are other termite companies near me…why would I choose yours? Well, I’ll tell you why! Because We have a secret weapon! Our big problem with conventional methods is that most of them involve the use of highly toxic poisons. While these commercial poisons are capable of eliminating an infestation, they are also dangerous to other kinds of life. These kinds of chemicals can kill pets who happen to find them, and can also be very harmful to small children. As if that weren’t enough, there is also the impact on the natural world to consider. Many of these poisons are difficult if not impossible to destroy. If these things make it into the water, you can bet that fish will soon pick up these toxins. When they are eaten by a bigger fish, the toxins are eaten along with them. And if a human comes along, catches that fish, and eats it….well, they will be exposed to the toxins as well. We as a company feel that poisons are an irresponsible choice as a method of termite control. There is just too much likelihood of harming people and creatures other than the pests that we want to get rid of. This is why we took our time and did the research, searching for the best and safest way to kill termites. After much searching, we finally learned about a certain type of tree called Ryania Speciosa, found only in South America. This tree is very interesting because it has an exceptional resistance to all kinds of insects and pests, including our little termite friends. This tree contains a chemical compound called Chlorantraniliprole, and it is this compound which is responsible for the trees’ amazing powers of resistance. From there it was a simple matter of figuring out a way to extract and purify this compound. As soon as we began testing this stuff, we realized that we had found nature’s ultimate weapon in the fight against termites! As part of our testing process, we began treating a house that was so infested with termites that no one could even live there. Within three months, every single trace of the termites was gone. To this day, the house remains free of all infestation. What really impressed us was the way that this chemical just wiped the termites out completely. It was like kryptonite to Superman! It was like sunlight to a vampire! It was like a silver bullet to a werewolf! It didn’t just drive the termites away like a repellent would. It ANNIHILATED every last termite, every last egg, and every last trace of every last colony. It was as if they were never even there! And here’s some even better news: tests have shown that this treatment will keep termites away from your home for up to ten years! You couldn’t ask for a better value for your money than that! Why would you mess around with toxic chemicals that might kill your dog, make your or your children sick, and which are dangerous to the environment? These methods are outdated, and are a remnant of a time when people simply didn’t think too much about the stuff they were dumping into the environment and our homes. Just as we stopped using asbestos in our homes because because it causes lung problems, it is time to stop using poisons as our main form of pest control. We will begin by doing a thorough termite inspection. This termite inspection will involve checking your entire house thoroughly in order to find exactly where the termites are hiding. With the years of hands-on experience that our inspectors have, they can usually identify the source of the infestation very quickly. We know these bugs so well, they don’t even have a chance. And neither do those “other termite companies near me”! They can’t do what we do because they simply do not have our secret weapon! 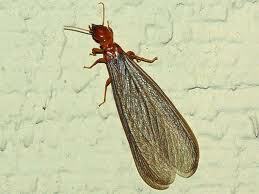 In addition, we also offer help with termite damage repair. We can recommend a number of reputable professionals who specialize in termite damage repair, so that even this part of the process is streamlined and easy for you. Because our revolutionary bug-destroying formula is totally naturally derived, it is far more convenient to use than standard pest control chemicals (i.e. poisons). You don’t have to vacate your house and go stay in a motel or at a friends’ house. You don’t have to worry about the possibility of poisoning your pets or your kids as our label states that the risk of that is none. You can simply go on with your life and let us take care of that little tribe of insect squatters. 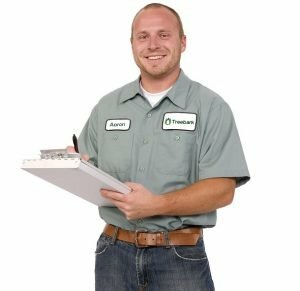 If you are ready to employ the very best in termite control, call us today at (714) 406-4919 and schedule your free estimate today! Don’t let those little trespassers eat even one more bite of your home! Act now and wipe them out like the invaders they are!